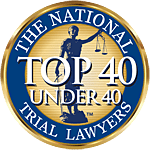 Associates and Bruce L. Scheiner, Attorneys for the Injured, is pleased to announce that Preston J. Scheiner has been named to the Top Trial Lawyers of America by the Multi-Million Dollar Advocates Forum. P.J. Scheiner was among 24 attorneys nationwide named to the Multi-Million Dollar Advocates Forum in June; Thirteen others were named Million Dollar Advocates. Members are typically nominated based on the cases they've handled. Multi-Million Dollar Advocates must have acted as principal counsel in at least one case where final judgment (not subject to appeal) or final settlement was at least $2 million. P.J. Scheiner is the son of Founding Attorney Bruce L. Scheiner and Cheryl Scheiner, who is the firm's administrator. Associates and Bruce L. Scheiner Attorneys for the Injured was founded in 1971. Preston J. Scheiner joined the firm in 2007 following graduation from the University of Miami School of Law and has since won a number of plaintiff verdicts in excess of $2 million. One such case was Greene v. Brown. Preston Scheiner represented the Greene family and co-counseled the case to a $9.1 million verdict after a 9-day trial. The couple and their two children, ages 6 and 4, were en route to Jacksonville International Airport after a Florida vacation when they were hit by a 17-year-old driver who crossed the centerline in a Dodge Neon at 50 mph. The father and both children suffered broken bones and other serious injuries. The mother suffered a traumatic spinal cord injury and other very serious internal injuries, which left her with serious life-long medical issues. The Million Dollar Advocates Forum was established in 1993 for the purpose of recognizing successful trial lawyers throughout the country. The forum provides a professional and objective way for fellow attorneys and prospective clients to review the accomplishments and experience of a given trial attorney. The forum also acts as a peer network, information exchange and referral service. Strict membership standards has kept membership to a total of about 4,000 attorneys working throughout the nation.